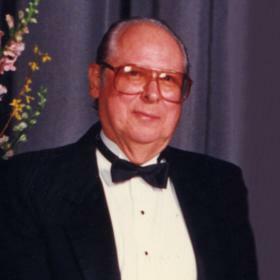 With a strong sense of determination, unwavering honesty, and an undauntable work ethic, Chester “Chet” D. Lautenbach Jr. lived a life rich in accomplishment and firmly centered in family. A self-taught, do-it-yourselfer who loved working with his hands, Chet welcomed each joy and challenge as a gift. A proud husband, father, and grandfather, Chet approached life with a candor and steadfastness that inspired all who were blessed to know him. Revered by many, Chet will long be held in the hearts and lives of those he loved. Growing up as the eighth of the Lautenbach’s nine children, Chet learned the values of family and hard work from a very early age. While his father provided for the family with his work as a painter, his mother took on the many responsibilities of the home. The family lived most frugally in their Madison Square neighborhood home as they had very meager means with which to meet their needs. 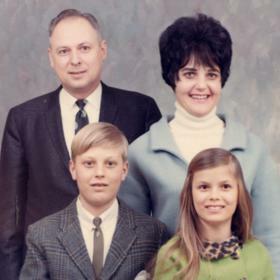 Though resources were limited, the family never felt a loss for love and the children grew up with a strong sense of connection. Chet felt a close bond with each of his older siblings, Cora, Marian, Sid, Elmer, Edward, Fran, Eleanor, but he was especially close to his younger brother Bob as they spent the most time together. From the start, Chet and Bob formed a true friendship that lasted their entire lives. As a child, Chet suffered from many childhood illnesses. As a result, he missed a lot of school. At one point, Chet was one of the first in Grand Rapids to be treated with a new medicine for his severe pneumonia, penicillin. Because of his health challenges, many family friends helped with tutoring and catching him up on the lessons he missed at Oak Dale Christian School. Despite their efforts, Chet was behind enough that he quit his formal schooling after seventh grade. He would later earn his GED through a correspondence program. During his adolescence, Chet's first job was at DeKuyter Hardware Store, where he cleaned the oil off of all the new parts that were shipped to the store. With a solid knack for learning things on his own and the fine art of tinkering, Chet and Bob confidently purchased a 1931 Chevy to restore. With signature determination, the young men successfully rebuilt the engine. When not working on a project or learning a new skill, Chet enjoyed playing cards, monopoly, and chess. He was also in a bowling league. During WWII, when his brother Sid was called to serve overseas, his son, Ron came to live with the family while Sid was away. Chet loved having Ron in the home as it felt like having a little brother. Eventually, Chet found work in a cemetery. Though the work afforded him a decent wage, when his older brother, Sid, introduced him to a friend who taught Chet how to do watch repair, Chet knew he’d found his calling. 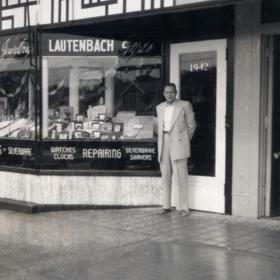 Not long after, Chet opened up Lautenbach Jewelry on Fulton Street, the store he would proudly run for many years. Over time, Chet recognized that the small jewelry store could not compete with the new big stores that opened. Pragmatically, Chet closed the store and found new work with Fahnestock Company as a commodities broker. It didn’t take long for Chet to establish himself in the company and he quickly found success as a broker. At one time, Chet sold a third of the nation’s eggs.  While attending First Christian Reformed Church on Bates Street, Chet had the good fortune of meeting Irene Aldrink who was in the choir with him. After dating for a time, the couple felt certain their futures were destined to be shared, and they married February 27, 1953. 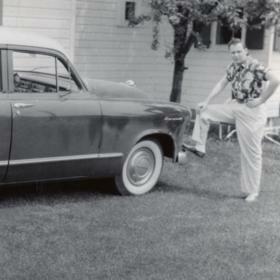 Following their wedding celebration, Chet borrowed Bob's car and the happy couple set off for a honeymoon at Niagara Falls and a marriage that would span 61 years. Upon returning from their honeymoon, the newlyweds settled at 622 Watkins Street in Grand Rapids. Here Chet and Irene joyfully welcomed their children: Wesley in 1955 and Starr in 1957. As the building of I-96 began, the family moved to Rickman Ave NE. While raising their family, the family made a tradition of vacationing at a rental cottage on Lake Michigan for a month each summer, or they traveled by trailer to Grand Haven. Over the years, Chet and Irene became great dog lovers. During their early dog years they started with their lapdogs: Fluffy, Tippy, and Sugar; then they moved on to German Shepherds Klute 1, Klute 2, and Baron. Eventually, they welcomed Afghans Natasha, Topaz and Cortez into their hearts. In addition to the dogs, Chet loved music, especially classical music, Sunday roast beef dinners, and dessert! He also amassed an impressive egg collection over the years. Chet's retirement years were filled with wonderful times enjoying the rewards of his hard work and determination. There were vacations spent on cruise ships and quality time spent with family and friends. 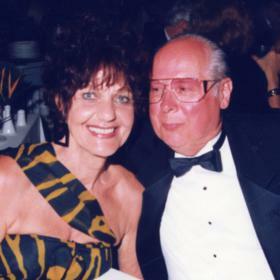 Chet and Irene spent these years splitting their time between their Florida home near Sarasota and the house they bought on Lake Michigan. Chet’s favorite way to spend time was in the good company of his grandchildren. A proud and devoted grandfather, Chet embraced each moment with his family as a treasured gift. Without a doubt, the absence of Chet’s steadfast presence has left a sense of uncertainty and loss for many. May it afford deep comfort to know that with each dessert we savor, classical tune we enjoy, and Lake Michigan wave we relish, we celebrate Chet’s legacy in each of our own lives. In this way, we assure that Chet’s spirit will continue to inspire others as he has so inspired us. Age 90, passed away February 5, 2018. Chet was born April 14, 1927, in Grand Rapids to Chester and Jenny (Westrate) Lautenbach, Sr. He was married for 61 years to Irene Aldrink who preceded him in death in 2014. Chet is survived by his children, Wesley (Brenda) Lautenbach of Cedar Springs, Starr (Bill) Humphries of Fort Wayne, IN; grandchildren, Justin Lautenbach, Dustin Lautenbach, Kendall Meijer and Westin Lautenbach. Also surviving are siblings, Fran (Pete) Wobbema of Grand Rapids, Bob (Hazel) Lautenbach of Grandville; sisters-in-law, Bea Idema, Joy Versluis, Ethel Brunger all of Grand Rapids; and many nieces and nephews. A funeral service will be held Friday, February 9 at 11 AM at Heritage Life Story Funeral Homes, 2120 Lake Michigan Drive NW. Friends may visit with the family on Thursday from 2-4 and 6-8 PM. 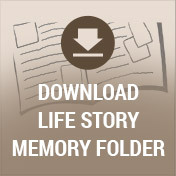 Please visit Chet's web page to read more of his life story, leave a memory or condolence at www.lifestorynet.com.